Today, we are pleased to welcome guest author Dwight Hughes. Confederate Raider: CSS Shenandoah. Oil on canvas by Patrick O’Brien. Commissioned by the author. The CSS Shenandoah, the most remote and loneliest outpost of the beleaguered Confederacy, surged around the Cape of Good Hope and into the Indian Ocean about equidistant between Madagascar to the north and Antarctica. These Southerners were months out of touch, with only their orders, prayers, and thoughts of loved ones to comfort them. Five thousand miles of cold, storm-swept and empty waters lay between them and Melbourne. 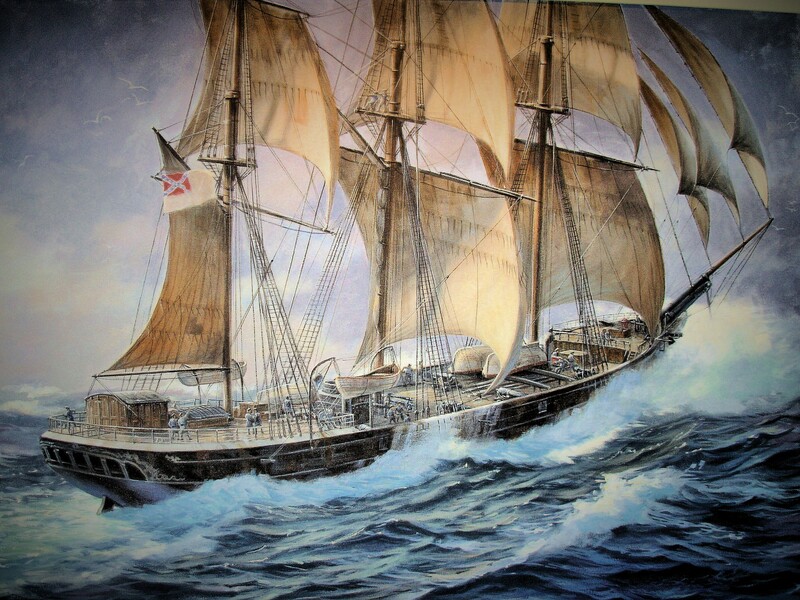 The former Sea King, a British tea clipper, had been purchased, armed, and commissioned on 19 October 1864 near the island of Madeira, four hundred miles west of Casablanca. Captain James I. Waddell, a North Carolinian, commanded the new Rebel raider. His orders were to continue the depredations on Union commerce so effectively advanced by the CSS Alabama, now resting silently on the bottom of the English Channel after her fiery clash in June with the USS Kearsarge. Shenandoah already had taken six Yankee merchants and one whaler on the trip down the Atlantic. Captain James I. Waddell. Naval History and Heritage Command. Lieutenant Francis Chew. Museum of the Confedaracy, Richmond VA.
Sunrise of 23 December was one of the most magnificent sights Mason had ever seen, but the old proverb—a red sun at night is a sailors’ delight, a red sun in the morning is a sailors warning—held true. The sky quickly darkened and by noon no glimpse of the sun was available for taking sights and figuring position. Conditions worsened through Christmas Eve day as the wind shifted to the west and another of those roaring forties gales blasted up behind it. The sail was progressively reduced to storm canvas. It was a night, thought Whittle, when cherished hearts in distant homes were wondering where they, the absent spirits, were, and his own dear Pattie must be thinking of him. “Most sincerely do I on the eve of the birth of Christ, invoke God’s blessing and protection on my dear, dear country and all my dear ones. God bless them all.” Whittle ordered up preventer braces on the starboard side and an extra ration of grog to warm the crew, stood another night watch with Chew and retired early. “Christmas at sea & Christmas on Sunday, a great beginning did we have,” recorded Dr. Lining. The officer of the deck entered in the log: “From 4 to 8 a.m. fresh gales from the southwest; very heavy sea running; shipped several seas; 5:20 wind increasing, close reefed main topsail; 5:30 battened down hatches.” Roiling walls of water swooped in from the starboard quarter, pushing the ship heavily to port, and then another from that side slammed them back again. The stern lifted and tilted skywards in a sickening corkscrew motion with the rudder high on the crest, even clearing it altogether, momentarily losing leverage. The thrusting deck buckled a man’s knees, making him feel twice his weight while the forecastle buried itself in foam. The waves surged forward, inundating the waist from one or both sides, men wallowing about clutching at lifelines. Then the stern plunged deep into the trough. Occupants and objects floated as gravity lost its force; the bowsprit soared to the clouds. In the valley between wet ramparts, horizons disappeared; the moan of the wind lessened and lower sails slackened, only to be awakened with a thunder of thrashing canvas as she surged upward again on the next wave. The sequence repeated wave after wave. At about 6:00 a.m., a big wave again submerged the spar deck. Whittle hollered for all hands and knocked out the aft gun port on the lee side. The flood rolled aft, stove in the engine room skylight, showered the engines, burst open the door to and inundated the wardroom, slopped into the staterooms and drenched everything. The wardroom finally was cleared with the help of stewards. The doctor bailed his stateroom with two pairs of stockings and then returned to his bunk in a useless attempt to get warm. However, he noted, “I never saw such good humour manifest. No cursing, all laughing and joking about our misfortunes….” He hoped friends and relations at home were as happy as they on Shenandoah albeit a bit more comfortable. Coming off watch at midnight, Mason had gone below, awakened the idlers to wish them a Merry Christmas and turned in, only to be disturbed at six o’clock by the noise of men hauling on the braces. When the big wave struck, the ship was forced up into the wind and, “commenced to roll like je ne sais quoi.” His hammock almost hit the overhead beams as water cascaded around the hatch cover setting everything adrift—chairs, books, tables, sofas, sextants, “swimming about in the most admirable confusion.” Mason tried to ride it out above the torrent snug in his hammock when to his disgust, Whittle’s cry for all hands echoed from above. “I must confess I thought things were getting rather bilious,” concluded the midshipman. The danger seemed to pass as Mason dressed himself, lashed up the hammock to keep it dry, secured his books, and scrambled on deck where men were at the pumps as wet as rats. The ship was put before the wind and scudded with the sea, rolling and pitching. Mason would go all day in wet boots and feet with no time to wash his face or clean his teeth, but he did manage to get a warm breakfast, which put him in better spirits. He spent the morning restoring order to his belongings, was able to shoot an altitude of the sun at noon despite the motion, and then stood the afternoon watch with Lieutenant Lee. Following the afternoon watch, Mason and Lee shared a late Christmas dinner—good mince pies and plum pudding with tolerable sherry. They kept plates in hand to prevent contents from being deposited in their laps. But the old ship got off pretty well with only a little water in the magazine. The crew had a good Christmas dinner, starring the largest pig in the pen—120 pounds—and kept up their sprits remarkably well. “For there is nothing in the world like a good warm feed to put a man in a good humor. As I had the mid watch I went to my hammock (wet) at eight o’clock.” Mason would console himself on watch eating more mince pies of which the steward had a bountiful supply. The CSS Shenandoah would continue her circumnavigation of the globe with stops in Melbourne and at the island of Pohnpei. In the Bering Straits, 22 to 28 June 1865, she captured twenty-four Yankee whalers, burned twenty of them, and released the others with prisoners. The last gun in defense of the South was fired from her deck ten weeks after Appomattox. On 2 August off the California coast, they received incontrovertible word of the war’s termination from a British merchant ship. Captain Waddell sailed the unhappy ship around Cape Horn to Liverpool and abandoned her to the British. The last Confederate banner was hauled down without ceremony about 10 a.m., 6 November, 1865. From left: Midshipman John T. Mason, Midshipman O.A. 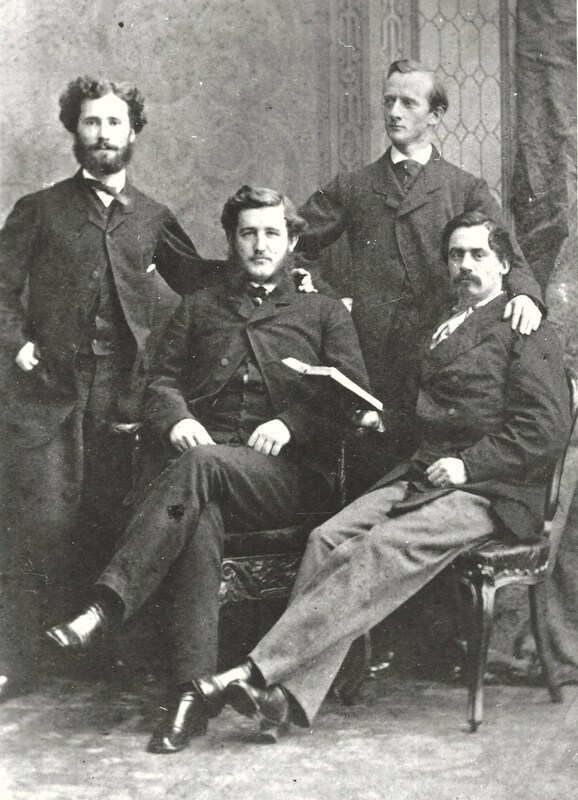 Browne, Lieutenant William Whittle, Lieutenant Sidney Smith Lee. Museum of the Confederacy, Richmond Va.
 Francis Thornton Chew, “Reminiscences and Journal of Francis Thornton Chew, Lieutenant, C.S.N.,” Chew Papers #148, Southern Historical Collection, University of North Carolina Library (not paginated), 18 December 1864. James T. Mason, Journal, Eleanor S. Brokenbrough Library, Museum of the Confederacy, Richmond, VA. (not paginated), 21-23 December 1864. William C. Whittle, Jr., The Voyage of the CSS Shenandoah: A Memorable Cruise (Tuscaloosa: University of Alabama Press, 2005), 96. Charles E. Lining, Journal, Eleanor S. Brokenbrough Library, Museum of the Confederacy, Richmond, VA. (not paginated), 24 December 1864; Chew, “Reminiscences and Journal,” 24 December 1864. Lining, Journal, 25 December 1864. Ibid. ; Grimball to Father, 23 December 1864, John Berkley Grimball Papers, David M. Rubenstein Rare Book & Manuscript Library, Duke University. Mason, Journal, 25 December 1864. Chew, “Reminiscences and Journal,” 25 December 1864. Cornelius E. Hunt, The Shenandoah; Or, The Last Confederate Cruiser (New York: G.W. Carelton, 1867), 72. Mason, Journal, 27 December 1864. James I. Waddell, “Extracts from notes on the C.S.S. Shenandoah by her commander, James Iredell Waddell, C.S. Navy,” in The Official Records of the Union and Confederate Navies in the War of the Rebellion (Washington, D.C.: U.S. Government Printing Office, 1896), 1, 3:807. Dwight Hughes graduated from the U.S. Naval Academy in 1967 with a major in History and Government and served twenty years as a surface warfare officer in ships ranging from destroyer to aircraft carrier and with river forces in Vietnam. He taught Naval ROTC at the University of Rochester while earning an MA in Political Science, East Asian studies. Awards include a Bronze Star for Meritorious Service and Purple Heart. He also holds an MS in Information Systems Management from the University of Southern California. For fifteen years, Dwight managed software development projects under contract for the United States Geological Survey relating to electronic mapping. His new career builds on a lifetime fascination with and study of Civil War naval history. Dwight has collected over 350 volumes of Civil War naval history, first editions, and scarce publications representing a professional naval library of that era. He presented papers at National Maritime Heritage Conferences (Baltimore 2010, Norfolk, VA, 2014), and at U.S. Naval Academy Naval History Symposia (2011, 2013). 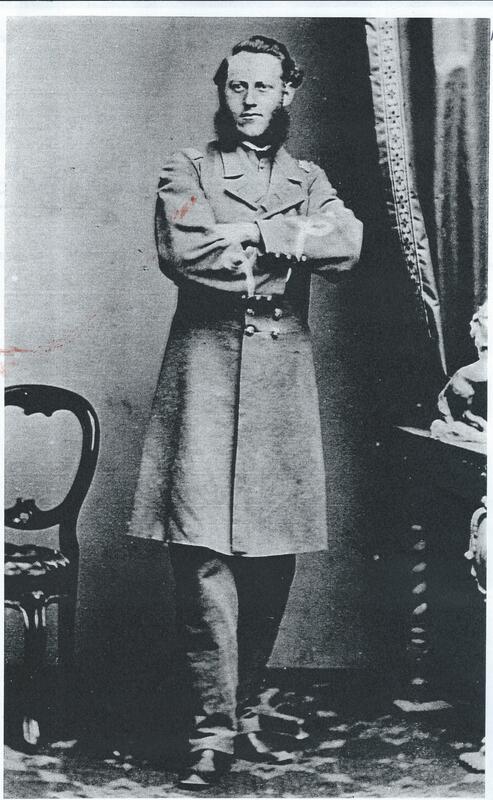 Dwight’s book, A Confederate Biography, The Cruise of the CSS Shenandoah, from which this paper has been derived, will be published by the Naval Institute Press in the fall of 2015. This entry was posted in Civil War Events, Common Soldier, Emerging Civil War, Holidays, Leadership--Confederate, Memory, Navies and tagged CSS Alabama, CSS Shenandoah, Francis Chew, James Waddell, navy, Trent Affair, USS Kearsarge. Bookmark the permalink. What a lovely piece! As ECW works to continue to define its place in a post-sesquicentennial world, this really makes a statement. I hope to see more posts dealing with alternatives to land battles. If “Civil War Memory” is the next big thing, we need to make sure we include the navies and marines of both sides this time around. Well done, good sir, and welcome aboard. I agree–beautiful writing! Likewise the painting–does the artist offer prints of it? Fascinating article ; thanks for posting !